Now that you have all the drawing materials and the environment settings ready, now its time to move on. We are not going to draw or sketch anything just yet, but instead focus more on getting to know how well you draw and how to improve using very easy drawing techniques.Many of the newbie artists out there tend to skip this step, only to return after not knowing how to draw realistic forms using simple shapes and lines.So, take your time practicing some of these methods learned here as it can prove to be very helpful for you once you get the hang of it. Pressure is an important aspect that you need to consider in order to draw what you want(lines,shape,shading). By knowing how to control the pressure of the tool you are using,(pen,pencil,marker) you can control how thick or thin, dark or light you want your strokes to be. Emphasizing the flow and rhythm of what you draw is vital and your skill with these qualities can help tremendously.For example; if you are working on a humanoid superhero figure, by using the strong and soft strokes, you are able to focus more of the viewers attentions toward the shape of the body.By consistently using the same strokes to draw the humanoid superhero figure, the quality of your drawing will look rather lame and boring.But when using different strokes, it always comes down to how much pressure you use. Thick Strokes – Thick strokes are achievable by applying pressure using the dull tip of the pencil.These strokes are used to shade large areas of the figure that is in shadow or covered.It is also used to emphasize more of the larger body parts (Buttocks, big round stomachs). Thin Strokes – Thin strokes are great if you are into drawing detailed illustrations and is also for drawing facial features (eyes, nose, wrinkles). Apply pressure using the sharp tip of the pencil will to get thin strokes. Darker and lighter strokes are mainly done by applying light or strong pressure,but keep in mind that by adding too much pressure or doing it too hard as it will leave pencil marks even after you’ve erased it. 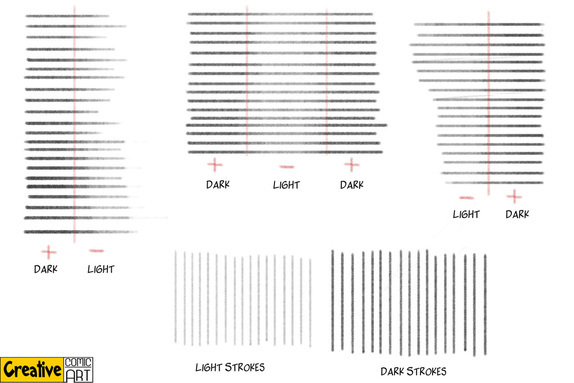 Dark Strokes – to get dark strokes, it is best to use soft grade pencils (6B-8B). Apply a strong pressure for these strokes and use them at section of the body that is in contact with another object . For example; between the grip of the hand holding a pipe, folded arms, area around the lower part of the body (buttocks,legs) when seated. Light Strokes – Use hard lead (4H or better) and apply light pressure for best result when doing light strokes.Light strokes are great for illustration that have a strong light source as it is used to outline the section that reflects the light.It is also used for foreshortening. Overall, most strokes are best done with softer leads as harder leads are difficult to work with when doing strokes despite it being sturdier or more solid. Faber-Castell pencils have strong soft leads, qualities that are great for drawing strokes. The exercise below takes about 20 to 30 minutes do.Practice your hand and create a series of lines starting from dark to light (by reducing pressure) and vice versa. Most crosshatching strokes are done using lines.Be it short or long,both are useful and are some of the most commonly used method for crosshatching. It is alright to use rulers to draw lines but it is not advisable to because you do not want to be really dependent on rulers to draw simple line. It is strongly recommended that you draw lines without any need for rulers and get used to drawing lines freehand. After regular practices, you will notice that you have become more confident when working on lines and at the same time making the lines you draw look natural. Short lines are great when used to create crosshatching.The strokes for short lines must have uniformed length because if some of the strokes are too long, you will have difficulties controlling the consistency that is needed. Long straight lines are commonly used to draw designs with geometric shapes like houses, skyscrapers, office buildings..etc.When drawing long straight lines, you can use rulers but only to help you visually in aligning the from of the structure or figure and making sure that you get the right measurements/proportions. 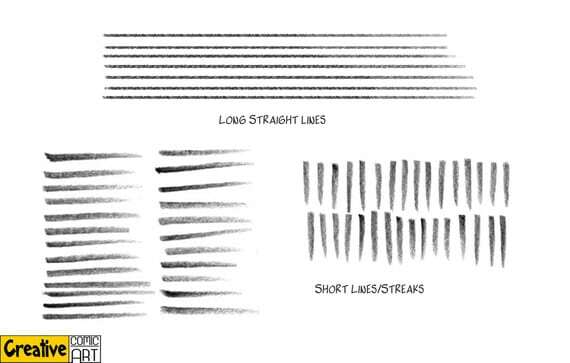 Practicing with these short lines can improve your consistency when drawing and help you when making crosshatchings (which includes short tapered lines). Drawing long straight lines improves on your observation skill and can help you combine and align body limbs properly.This is very important in making sure that the measurement and proportion of the figure are correct. Whether it’s short or long, curves are the foundation of drawing.Most drawing involves curves especially human figures. Hard curves are used a lot on male human figures.When drawing male characters, you want them to be solid and have a strong features to represent them.The areas that hard curves are best used for male figure is around the chin/jaw, chest and arms. Female figures on the other hand, are best drawn using soft curves.With soft curves you are able to make a figure more sleek and shapely, which is perfect for female figures.It is also easier to draw the hourglass shape for women using soft curves.You can still use the hard curves for female figures to make them look stronger and have a more solid feature, but even then you will notice that too much hard curves on a female figure will make her look awkward and less feminine. Comic artists use basic shape for a lot of things.Shapes like circles,triangles, squares are often used for drawing human figures, vehicles, animal figures, buildings and even landscapes.Here are some common exercise that can help you develop your skills at drawing anything you want. 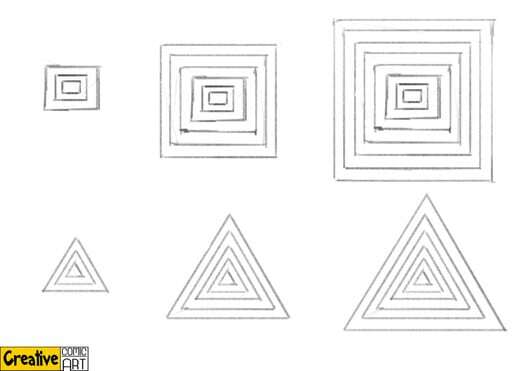 Shapes Inside Out – Choose a single shape (circle, triangle, square), and begin by drawing a small shape that you chose followed by larger size of the same shape around it (example-A). Maintaining the same proportion will be difficult but the goal here is to make sure that the space between each shape is consistently the same.This exercise can give you better control when you draw and get you the habit of concentrating on a certain part of your artwork before moving on. 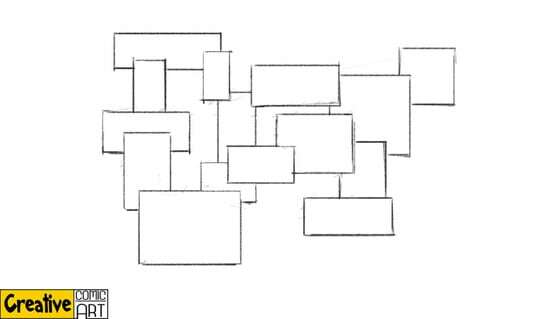 Overlapped Shapes – Draw a series of overlapped shapes of your choice and be sure to draw them in different sizes,as shown in example B.This exercise can help you understand how overlapping shapes and form can work into creating depth which is very useful in comic art. Just Circles – Circles are no doubt one of the most important shape that helps you draw basic figures(especially human figures). 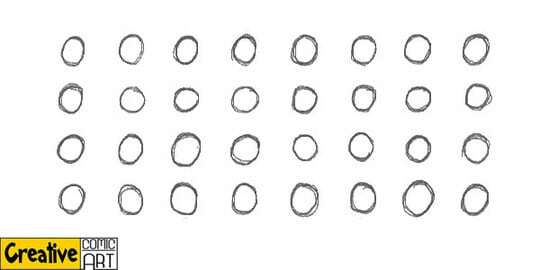 Circles are mostly used in sketching or drawing the outline of what you want to draw.The reason it is used more for a human figure is because a human figure has more round body parts than others.Body parts like shoulders, elbows,the head, facial features all have circle or sphere like shapes and knowing how to draw circles can definitely help you draw human figures better. Domino Stack – Rectangles are often used as outline for long parts of the bodies like the arm and legs. 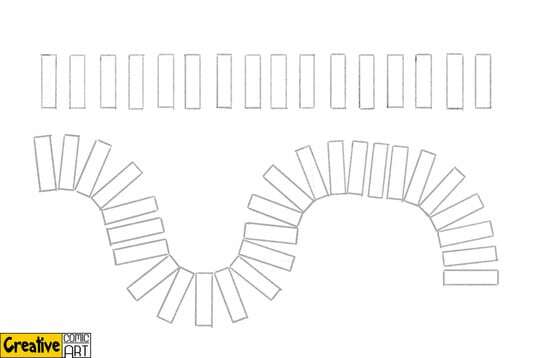 Start this exercise by drawing a series of rectangles arranged closely similar to stacking dominoes and shape to form a winding up and down( see example D). This exercise can help you to familiarize with body limbs that tilt at different angles and draw better rectangular like forms. The best advise anyone can give with these exercise is to Practice, Practice, Practice .By getting used to these exercise, you will start to notice how you have become more versatile in drawing and at the same time you get to point out which part of drawing that you are weak in.